Here is the recipe for both the easiest and quickest vegetarian curry ever and grilled sourdough sandwiches made with it. Enjoy!! 1. Heat oil on medium flame in a large frying pan or wok. Add cumin seeds, hing, curry leaves. Let seeds splutter. 2. Add cauliflower florets and potatoes, stir-fry for 5-10 minutes until golden brown. 3. Add ginger, fresh chili, coriander powder, turmeric, salt and chili powder followed by chopped tomatoes. Mix well. 4. Cover and reduce heat to low-medium flame. Cook for about 10 minutes, remove lid and stir. Cover and cook for another 10 minutes until potatoes are cooked. 5. Sprinkle garam masala, lemon juice and coriander leaves. Stir gently. 6. Serve hot with rotis or rice or as sandwich filling. 1. 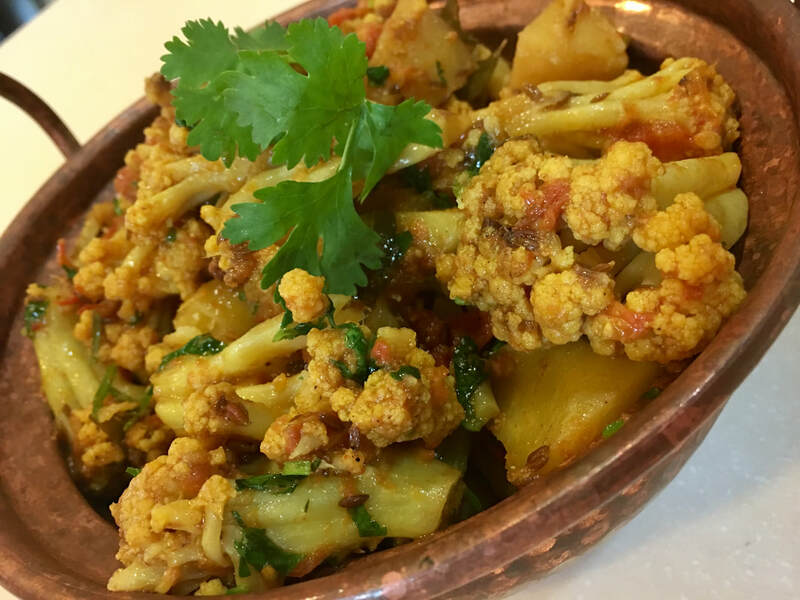 Lightly mash Aloo Gobi to slightly flatten potatoes and cauliflower florets. 2. Sprinkle cheese and place sliced cucumbers on a slice of sourdough bread, top with lightly mashed Aloo Gobi followed by another slice of bread. 3. Grill on a hot griddle pan or sandwich maker until hot and toasty on both sides. Serve with Thai chili sauce or ketchup.